In our quest for the next acai juice and organic pistachio nut we forget how remarkable the inexpensive, common vegetables are. Cabbage is a big ol power house of vitamin C. Even more impressive, cabbage is famous for a specialized, naturally-occurring nitrogenous compound known as indoles. Research indicates that indoles can lower the risk of various forms of cancer, including breast cancer. Chopping and chewing releases the enzyme (myrosinase) that helps form the indoles. Let’s shred! I loved learning that the ancient Greeks and Romans used a preparation of lard and burnt cabbage leaves as an ointment for disinfecting wounds. Rub it on after your next jousting match. You laugh, but it holds up in a court of science. Cabbage extracts have been proven to kill certain viruses and bacteria in the laboratory setting. This humble vegetable boosts our immune system’s ability to produce more antibodies. It also provides high levels of iron and sulphur; minerals that work as cleansing agents for the digestive system. Holy cabbage leaf! Your dinner table should not be without it. Make Nappa Cabbage Slaw with Toasted Almonds today. Please TELL US YOUR FAVORITE SLAW RECIPE. Our collective health is depending on it. 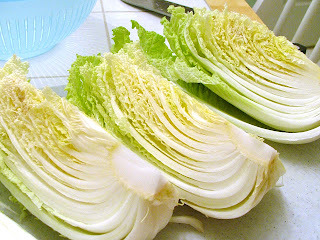 I discovered Napa cabbage last year and love it. Will be trying out your recipe soon! I also really enjoyed the Fusion Coleslaw recipe that I found in the cookbook produced by Earthbound Farms, called Food to Live By. Very very tasty. Thanks for having a fun website! I love cabbage. If my family loved it more, I would make it every day in the winter. I’ve never met a cabbage I didn’t like. As it is, one of my kids adores coleslaw, and one of them loves cooked red cabbage. But neither will eat what the other likes. I don’t have a recipe for either. Cool. Thanks for writing Sarah and Julie. I also like doing the Napa slaw with a Thai variation and using cashews and cucumbers. And I’ve always been a coleslaw fan – I like it with some lemon mixed into the mayo. I’m a huge fan of Napa cabbage. I love the texture and it’s fun to mix with other types of cabbage for a little variety and color. Adding a sprinkling of cilantro like your video shows provides a nice punch as well. One of my favorite cabbage recipes is Green Tea Leaf Salad which is an adaptation of a Burmese salad (or slaw you could say). You can adapt the salad even further by just using what you have on hand – just shred some cabbage, top with any number of nuts or seeds, a tangy dressing and you’re good to go! I’ve done this with raw kale as well – very tasty and nutritious. Our favorite slaw is a Mexican one, which we use as a crunchy/cool topping for tacos. I shredd whatever kind of organic cabbage we have on hand. I mix together a few tablespoons of whole milk yogurt and some herbal vinegar and a pinch of salt and pepper. I then toss this “crema” with the shredded cabbage, and voila…add a hit of lime juice to your taco, a bit of this slaw, and you’re in Mexico City heaven! Can’t wait to try a few of the new recipes I see here. Coleslaw rocks! Brooke – yes. I like the yogurt/vinegar idea. Double digestive whammy. Thanks. I’ve had your napa cabbage salad 4 days in a row (not the whole recipe, a portion for one). It’s delicious and filling, which is good because I’m trying to lose weight. I think it’s working! The only change I made was to add a cut up apple and some garlic greens from the garden. Thanks! Combine the coleslaw mix, carrot, radish, jalapeno and cilantro in a bowl. In a separate small bowl combine the mayo, vinegar (add a little at a time, salt, pepper, and celery seeds. Whisk mixture to combine and add more vinegar, tasting as you go until you reach the desired acidity. Add mixture to the coleslaw mix and combine well. Cover and place in the refrigerator for a few hours to allow the flavors to combine. Thanks for the recipe. I’ll try it! I LOVE cabbage and the health benefits are great. There are a ton of recipes out there for slaw, but I am a traditional slaw person myself, I have a great recipe, I will dig it up and post it. I haven’t made it in forever, but it is time to drag it out…it goes so well with black bean burgers! Thanks for the site, I love it! I collect cilantro recipes and I can’t eat mayo. Mix above together. Chill for up to two days. Toss in dressing, just before serving. Whisk above together. Chill for up to two days. Toss Lime&Garlic dressing with chilled slaw, just before serving. Allison – share your black bean burgers with us! Ana, the Cilantro Slaw sounds like it would be heaven with Mole con Pollo (which we will post in a couple of weeks). Wow. I eat a little sauerkraut (raw, made the old fashioned way and naturally fermented) every day because it’s great for the digestion and all things colon and bowel, but man – it’s great to know it may help prevent breast cancer. My mom is a 6 year breast cancer survivor, as is my aunt. This hits close to home. Thanks! To all – take heed of Carrie’s post. It sounds wild but making your own fermented vegetables and eating them is a powerful way to improve digestion and strengthen the immune system (I’ll have to do a video on it sometime!). My students at Bastyr are totally into fermenting. They ferment cabbage, beets, kale, daikon, ginger, garlic, carrots, onions, broccoli – basically anything in the refrigerator. I’ve taken up the habit. Don’t know if you’d call ir sauerkraut or kim chee but its good. Do you still get the same properties with raw and cooked cabbage? I cook the cabbage so it still has mild crunch, but I like to saute onion, garlic, ground turkey, add herbs like cumin and a touch of oregano, then chop up large amounts of cabbage, add in tomato paste, tomato, more herbs, and a little red wine. Turns out totally yummy, so I hope I can get close to the same benefits with somewhat cooked as raw? Shredded cabbage, drained crushed pineapple, grated apples, little bit of sour cream or yogurt, and if it’s not sweet enough for you, add some apple juice concentrate or your sweetener preference. Love the website! Thanks Cynthia and Family! actually very little, and we need some help. This site has been a God Send. Thank you so very much I will try the Cabbage Slaw tonight. I will write and let you know how much we enjoyed this dish. Glad to be of service Mitzi. Yes please let us know if he liked it.